This was the most unique setup for a company party I’ve ever experienced. Being on the stage with the projector screen playing Halloween movies behind me was really interesting. The decorations were great, too! This was a private company party at the Lucky Lab in NW Portland. 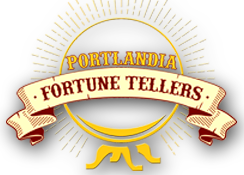 Portlandia Fortune Tellers at a private Steampunk themes Halloween party in Tigard, Oregon.